Apple today announced new models in its quad- and eight-core Mac Pro workstation lineup, moving the systems over to Intel's Nehalem Xeon processors and boosting their graphics capabilities. There are two base configurations: a quad-core model and an eight-core model. 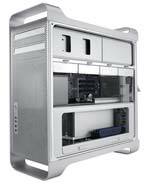 The other base configuration uses two 2.26 GHz quad-core Intel Xeon 5500 processors with 8 MB of shared L3 cache per processor, along with the Nvidia GeForce GT 120 with 512 MB of GDDR3 memory.It comes equipped with 6 GB of 1,066 MHz DDR3 ECC SDRAM (expandable up to 32 GB). Al other features are identical to the quad-core model. Options include 802.11n networking, up to 4 TB internal storage (using 1 TB storage in each of the four internal bays), and an ATI Radeon HD 4870 with 512 MB of GDDR5 memory. The new models, which are available now, start at $2,499 for quad-core systems and $3,299 for eight-core systems. Further information can be found here.